Brian just got home from work and we were sitting in the office talking so I decided to lay her down on her tummy time mat and she rolled over all on her own 4 times in a row! She immediately stopped when she saw the camera so I don't have a video yet but I will try my best to get one soon! I am a very proud Mommy and I am so glad that Brian and I got to watch her do it together! 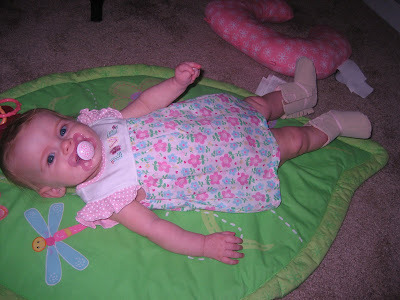 Here she is right after she spotted the camera and stopped The other day I was bored and she was being grumpy so I put her in a dress and cowgirl boots! 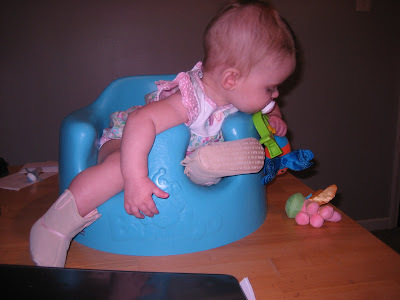 No one an be irritated with a baby in cow girl boots! 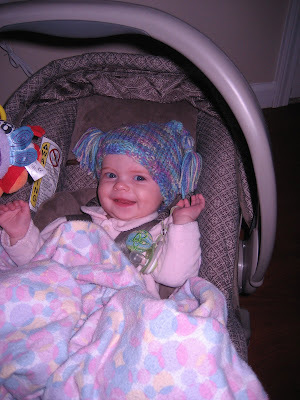 We love this hat that Tonia got for her! Here she is last night after we got home from Church This is a video clip of Kenley "walking" she really is picking up her own feet! Sorry its the wrong direction, I can not for the life of me figure out how to flip it. Yay! Big girl Kenley! Auntie Amy is VERY proud! 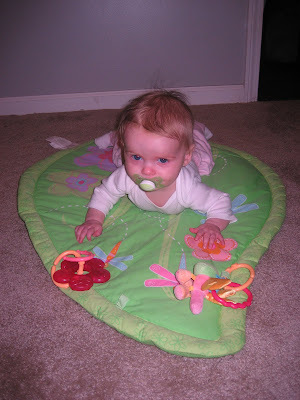 She'll be walking before she lets you video her rolling over! :) What a big girl!